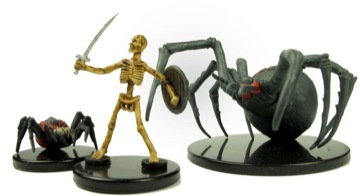 Giant Spider (Fyorlag size), Skeleton & Giant Caveweaver Spider (bite off a Medium figure's head size) revealed in the Paizo blog today (11/18 ). That leaves the Wolf, Gargoyle, last two Goblins and the final mystery figure (next week?) to be revealed. It's going to be hard not buying a bunch of these. I may have to see what C3V cooks up for some of the sculpts I really like. Trust me I am posting the Paizo pics from the Blog in the Inner Sanctum and will push using these figures...especially if Auggies will be selling singles. -ZB, excited about the new Pathfinder series. BTW, Paizo also plans on selling singles on their website, IIRC. Many sites will have singles trust me but as Auggie has told us they all have to be preordered now and there is not going to be a back stock at suppliers for stores to get more from. So really the best bet to make sure there is a large amount is to either pre-order with the store or at least let the stores know there is interest. The bigger the store of course the more likely they are to buy a bunch but if we want to use them we need to make sure they are plentiful. Four more sculpts at the Paizo blog: a leaping Wolf (C), mummy as skinny as Sudema (U), and totally redone Chimera, with wings (R). Last week featured the Frost Giant (R), who actually has hot-swappable left hands, with two different weapons. Upcoming: the Gargoyle, last two Goblins, and painted versions of the Orc Warrior & Lizardfolk Champion. THEN, previews for the 60-figure Rise of the Runelords set, with many more Large figures, and some Common ones at that. Kor's Heroes & Monsters photo blog is now completely updated with actual pictures of all miniatures instead of computer renders. There are 13 common, 10 uncommon and 17 rare sculpts, and street date for the set is January 11. I'll have my order in hand in about 2 hours though I cannot ship until the 11th. I'll post a review this evening. Piazo has the set list on their site but here it is for convience. When are pre-order prices going to be on your site? I'll make a separate post when I do but it might be as early as tonight. I like to warn people about the volatility of prices and inform them of our preorder policies.